Max downed serious amounts of Ben & Jerry's during our Vermont trip. 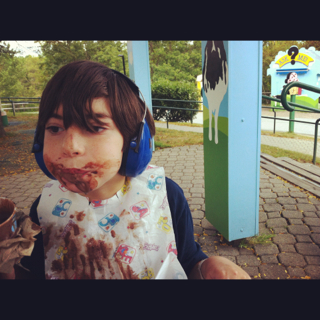 Ben & Jerry's Chocolate Fudge Brownie, to be precise, his new favorite flavor. Max showing us exactly what to buy at the store. 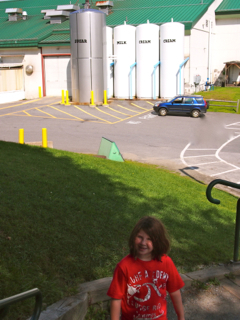 So it would have been criminal not to stop by the Ben & Jerry's Factory in Waterbury, Vermont. 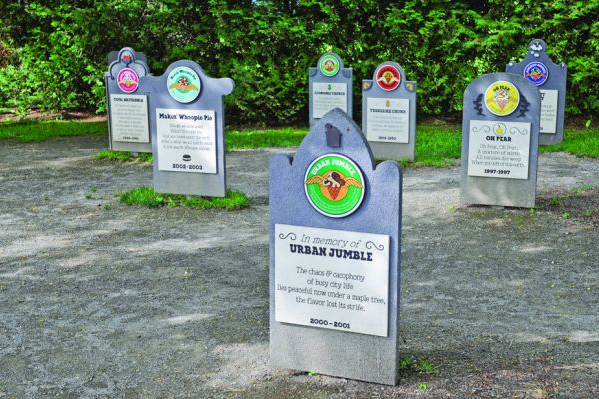 First we checked out the flavor graveyard, where you could pay your respects to now-defunct flavors. I thought both kids would get a kick out of the factory tour, but I knew I'd have to figure out a way to coax Max in since crowds aren't his thing. The tours leave about every 30 minutes and last as long, $4 per adult and kids under 12 are free. We waited outside; I knew Max was going to get antsy if we went in. I grabbed a staffer who was walking by. "Do you mind if I pay you for the tickets here?" I asked. "My son has some sensory issues and we want to stay with him here and help him chill before the tour starts." She smiled at the kids. "Wait here," she said. She came back with tickets for us; when I went to pay her, she said "That's OK," and walked away. 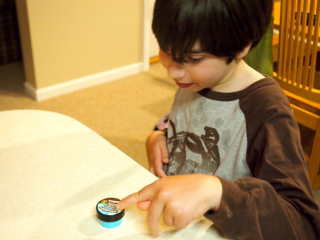 It was the Chocolate Fudge Brownie lip balm that lured Max in; I bought it for him in the gift shop, and dabbed it on his lips as we started the tour. Max had to be coaxed in there but then he was mesmerized. He was particularly amused when ice-cream being squirted into cartons accidentally spilled onto the floor and had to be sucked up with a giant vacuum (no worries, it gets made into cow feed). After the tour, we got samples—just a teeny cupful. So we headed over to the Scoop Shop. Sabrina's into Americone Dream (vanilla with caramel and pieces of fudge-covered waffle cone). I tried Coconut Seven Layer Bar (a kind you can only get in ice-cream stores) and, well, whoa. Dave likes their new Banana Greek Frozen Yogurt with Peanut Buttery Swirls, both because it is tasty and he has convinced himself that he's making himself healthier by eating it. Max had very little room for dinner that night. He now applies Chocolate Fudge Brownie lip balm every morning. Here's my favorite Max chocolate ice-cream video, taken three years ago when we were at Duke University getting Max the stem cell transplant. 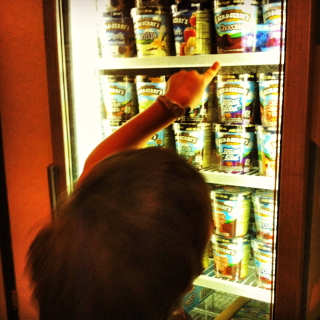 So, what's your child's favorite ice-cream flavor? Oh icecream envy!!!! My fav BJ is the cherry and choc one that I first tasted in Tahoe many moons ago! Cooper loves coconut, pep mango and the baby would eat anything! We got an icecream maker last year and love making up new flavours! Love the pics of Max enjoying his icecream! I agree the the commentator above...that pix of max covered in chocolate is awesome! Looks like you had fun. Wow, Max looked so young 3 years ago. My son likes cake-flavored ice cream. I'm so in live with Ben and Jerry's delightful creations that we may name out second son after them. I just love seeing an alert in my email for your blog. 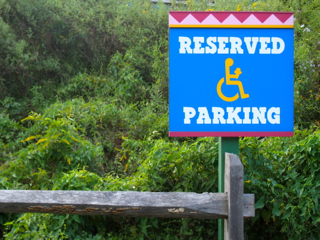 Although my son has different issues we deal with, a lot of our experiences are similar. You show the joy of having these little guys (and girls)! 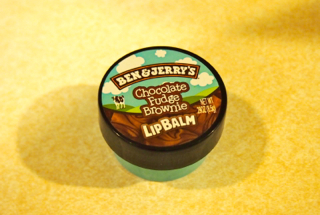 Ben & Jerry's new chocolate therapy is just perfect! We love going to the factory and the flavor graveyard. My mom prefers vanilla ice cream for my brother, who has CP, because it doesn't stain his shirt as much! I took that tour too! Fun place! That video is unbeiveably cute! I don't think I've ever seen a kid more excited for chocolate ice cream! Glad you all had fun at the factory.. I enjoyed the tour when I was there a few years ago!